The 23d was the United States Army Air Force China Air Task Force organization took over the operations of the 1st American Volunteer Group (AVG) of the Chinese Air Force when the AVG was disbanded. Some members of the AVG joined or rejoined the United States Air force. Some volunteered to serve for an extra short period to help with the changeover. The 74th, originally the 1st Pursuit Squadron “Adam and Eves” of the AVG, was one of the original squadrons in the 23d to see combat action in the Far East. The Fighter Group used P-40 Warhawks, and later P-51 Mustangs, to cover a large operational area and diverse combat roles. The area of operation extended beyond China into Burma, French Indochina (Vietnam), and Formosa. The mission taskings included counter air campaigns, strafing and bombing Japanese forces and installations, escorting bombers, flying reconnaissance missions, and intercepting Japanese bombers. The fighter group excelled in these roles and received the Distinguished Unit Citation for its exceptional performance during the war. Following World War II, the 74th was activated at various times and locations throughout the world. From 1946-1949 the 74th flew the P-47 at Northwest Field, Guam. During the years of 1951-1954, the 74th flew the F-86 and F-94 at Presque Isle AFB, Maine. The 74th then moved to Thule AB, Greenland, from 1954–1958 and flew the F-89. During the period 1958-1972, the 74th was deactivated. In July 1972, the 74th rejoined its sister squadrons for the first time since 1949 when the 23d Tactical Fighter Wing was activated at England Air Force Base LA. The 74th began operations flying the A-7 Corsair II in 1972 and transitioned into the A-10 “Thunderbolt II” in the summer of 1981. During the 1980s, the 74th lived up to its proud history by receiving the Air Force Outstanding Unit Award five different times. 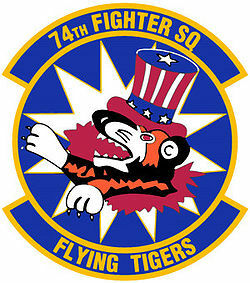 The most recent combat tasking for the 74th was during Operations DESERT SHIELD STORM. From September 1990 until 11 April 1991, the 74th earned high praise for its performance during the campaign against Iraq’s elusive Scud-B mobile missile launchers. On 15 February 1992, the 74th was again inactivated at England Air Force Base as part of the Air Force\’s force structure realignment. It was reactivated 15 June 1993 at Pope AFB NC as part of the 23d Wing, the second composite wing built from the ground up. The 74th began operations at Pope AFB flying the F-16C/D Fighting Falcon. In July 1996, the F-16s departed Pope AFB and the 74th Fighter Squadron transitioned back to the A-10 aircraft. The unit completed a deployment to Afghanistan in 2011 in support of OEF, earning the achievement of Outstanding Unit with Valor.